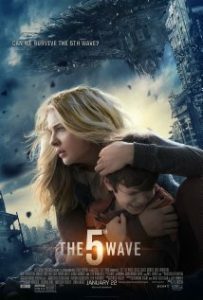 The 5th Wave is a 2016 American science fiction action film directed by J Blakeson and stars Chloë Grace Moretz, Nick Robinson, Ron Livingston, Maggie Siff, Alex Roe, Maria Bello, Maika Monroe and Liev Schreiber. It was released on January 22, 2016, in the United States by Columbia Picture and received generally unfavorable reviews from critics. If you're looking for another apocalyptic tale of adventure and survival after an alien invasion, check these teen titles out. It's just another day of high school for Zack Lightman. He's daydreaming through another boring math class, with just one more month to go until graduation and freedom. Then he glances out his classroom window and spots the flying saucer. After an alien force known as the Icon colonizes Earth, decimating humanity, four surviving teenagers must piece together the mysteries of their pasts - in order to save the future. When jobs typically are done by humans are replaced with alien technology from the vuvv, Adam's parents have no money for food, clean water, or medicine. Adam and his girlfriend Chloe are forced to get creative. Since the vuvv love anything of "classic" Earth culture they begin recording 1950s-style dates which the vuvv watch in a pay-per-minute format. As the money rolls in, how far will Adam be willing to go to give the vuvv what they want? Li is the only human left after aliens take over the planet, but she learns to stay alive, with the help of her human-sympathizing father, by assimilating to Abdolorean society, which she must keep a secret at all costs or risk the terrifying consequences of exposure. View more suggestions for The 5th Wave.